Although it wasn’t the night that Team Honda HRC and Cole Seely were hoping for, everyone was pleased with the Californian’s impressive come-from-behind performance in the main event, as he advanced from 16th place after the completion of the fist lap to fifth by the checkered flag. 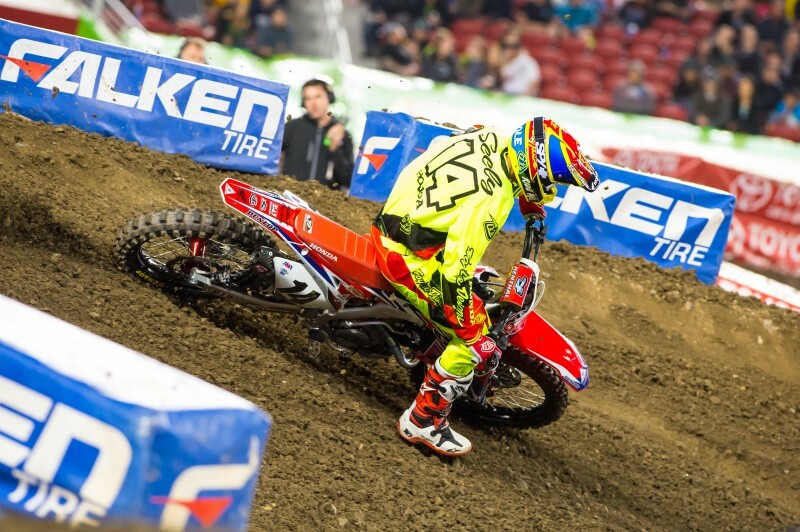 Seely’s result didn’t come easily, as an unfortunate fluke incident in his heat race affected his performance throughout the remainder of the evening. 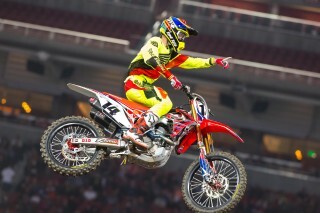 GEICO Honda’s Eli Tomac also overcame a bad start in the main event to charge to second place by the end. This result marked his fourth consecutive podium appearance, and his ninth of the season. 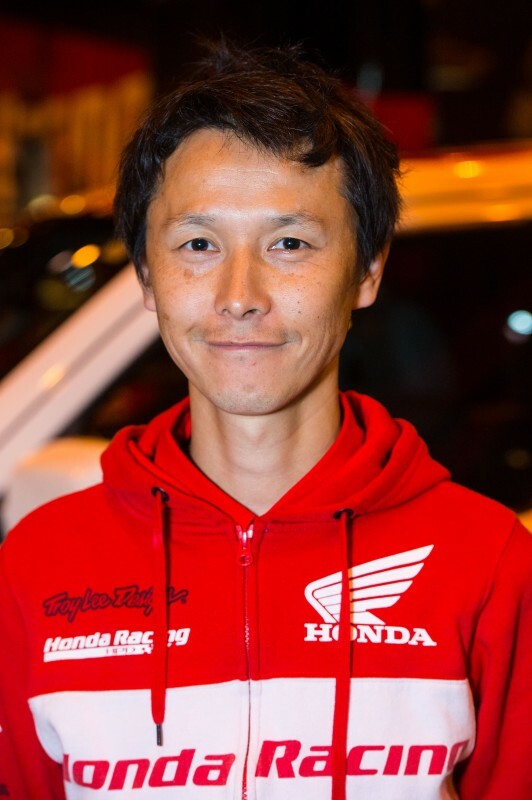 Prior to Saturday’s gate drop, the Honda Red Riders headed to Fremont Honda in Fremont, California, to sign autographs and spend time with fans. 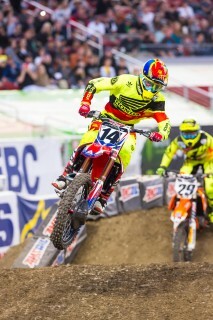 In attendance were Team Honda HRC’s Cole Seely and GEICO Honda riders Eli Tomac, Matt Bisceglia and Malcolm Stewart. The riders will attend another autograph signing at Belleville, New Jersey’s Motorcycle Mall on Friday, April 24. 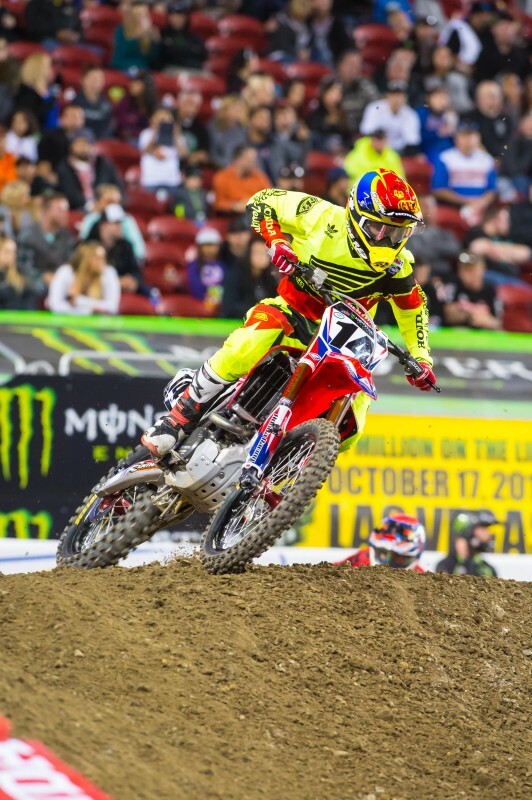 During the daytime program, Seely set the third-fastest qualifying time at 50.345 seconds, just .587 seconds off the pace of Tomac, who qualified first with a 49.758. 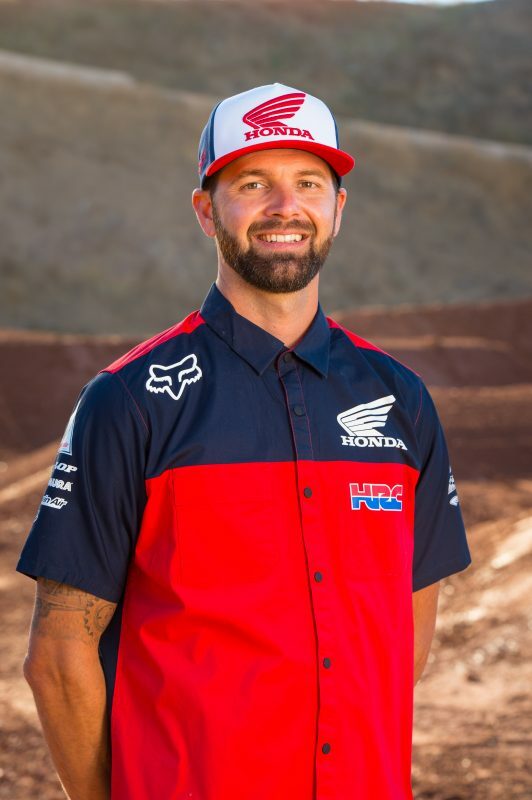 On race day, Seely’s mechanic Rich Simmons and Tomac’s mechanic Brian Kranz, who are both graduates of Motorcycle Mechanic Institute, met with a group of students from the local campus to provide a glimpse into the life of a factory mechanic. 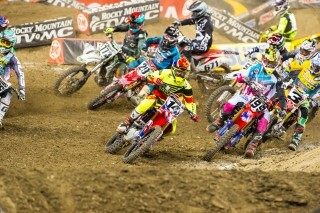 Seely’s performance and lap times in his heat race indicated that he was faster than his result. 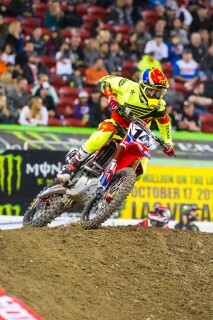 He launched off the line to a second-place start, took over the lead on lap two and quickly opening up a comfortable gap. 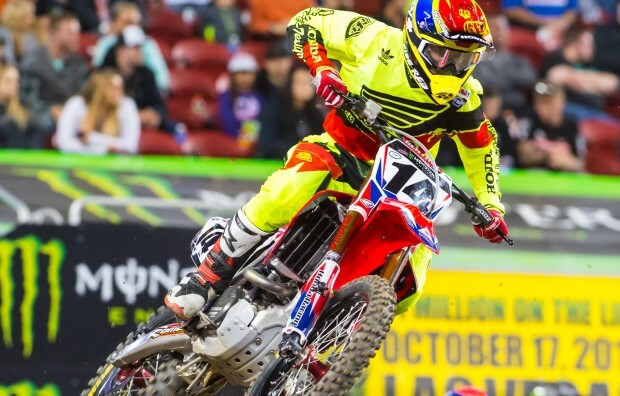 It looked as if the premier-class rookie was going to score his fourth heat-race win of the season until he went down after colliding with an official who was removing a fallen rider’s bike from the track. 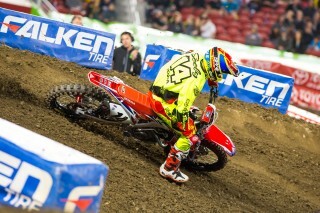 Seely was the fastest rider in the race, setting a lap time of 49.106, but he finished fifth after remounting. 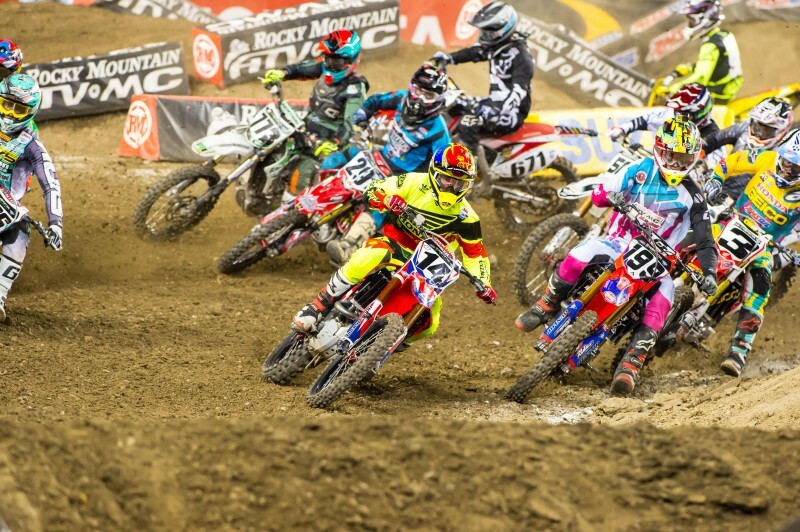 Both Seely and Tomac were forced to advance through semi two, in which they finished 1-2 with Seely leading every lap of the race. 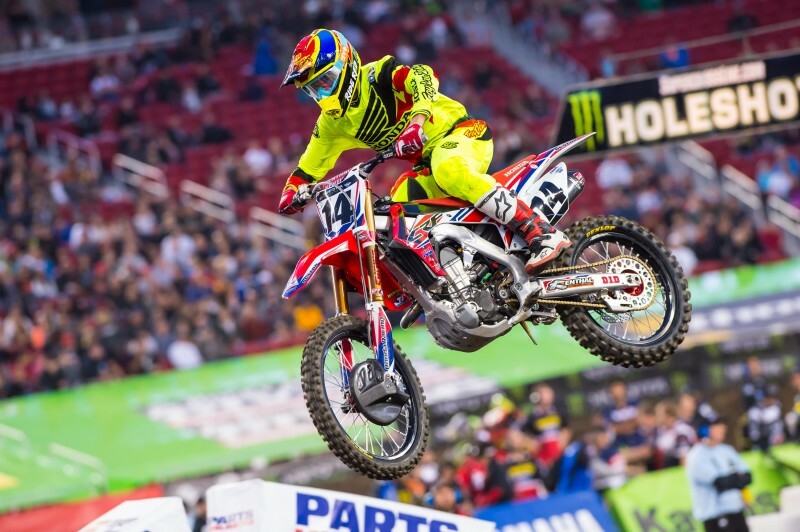 This is a short week for Seely and Tomac, who travel east to participate in Thursday’s press conference at New York’s Grand Central Terminal. Both riders return to action on Saturday, April 25, in East Rutherford, New Jersey. 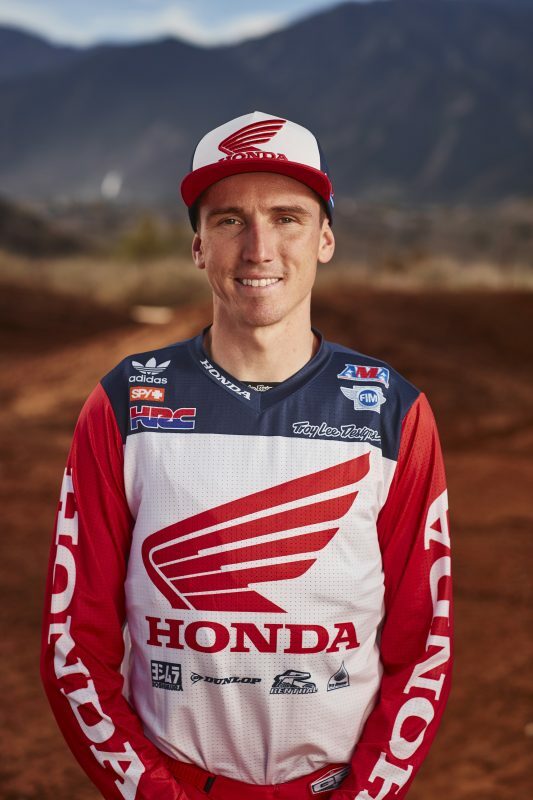 Following all the action at Levi’s Stadium, Team Honda HRC’s Cole Seely spent his Sunday at the famous Long Beach Grand Prix as a guest of Honda Performance Development, a subsidiary of American Honda Motor Company that contributes to aspects of the Supercross racing program. While in attendance, Seely got the opportunity to visit the starting grid prior to the start of the 80-lap race and to meet HPD-supported driver James Hinchcliffe of Schmidt Peterson Motorsports.